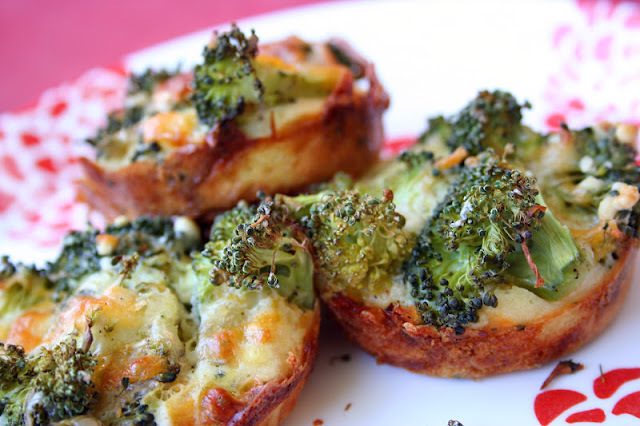 The original recipe for these called for chicken, but I figured there's nothing better than the simple combination of broccoli and cheese. Am I right? These would make the perfect appetizer or party food. They're just tiny bites of full flavor. Yum. 1. Heat oven to 375°F. Spray 12 regular-size muffin cups with cooking spray. 2. Heat oil and cook broccoli about five minutes. Mix in salt, onion powder and pepper. Cool 5 minutes; stir in cheese. 3. In medium bowl, stir baking mixture ingredients with whisk or fork until blended. Spoon 1 scant tablespoon baking mixture into each muffin cup. Top with about 1/4 cup broccoli-cheese mixture. Spoon 1 tablespoon baking mixture onto broccoli-cheese mixture in each muffin cup. 4. Bake about 30 minutes or until toothpick inserted in center comes out clean and tops are golden brown. Cool 5 minutes. With thin knife, loosen sides of pies from pan; remove from pan and place top sides up on cooling rack. Cool 10 minutes longer, and serve.